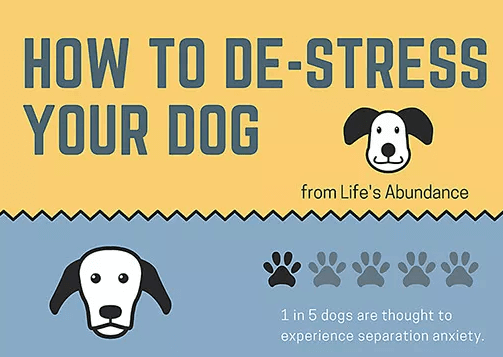 I often hear from pet guardians about the stress their dogs are under, but almost never hear them talk about reducing their own stress or that of their dog! Thanks for the reminder and guidance! My dog is 5 going on 6 and has always been stressed out for some reason ...she continually licks the air and twists her head back and forth whenever she's nervous. She doesn't like loud noises or machinery, lawn mowers or cars. She notices anything different placed in the house or outside ...growls and barks at it. Picks her food from her dish with her paws and eats it from the floor. Why? Hi there! It's not uncommon for dogs to take their food from one location and eat it in another. Think of it like a big family of hungry boys ... every man for himself! Dogs have this instinct to take what they can get and guard it from the horde, even if he or she is the only dog in the house. Hypersensitivity to everyday stimuli may be cause for concern. If anxiety has become your dog's go-to reaction, I would urge you to talk to your veterinarian, especially if it seems like the condition is worsening. We have lots of tricks and tools to help! Please keep us posted on her progress! Hi, I hope you will be able to help me. I have two male dogs. This is not a new situation. One is 4 and the younger is 2. I have had both since they were 8 weeks old. They used to get along just fine, but for the past month all they do is growl at each other all day long! I scold them both. One will start it then later the other one will. I'm pretty sure they are trying to argue over which one is the Alpha male in the household. The constant growling is getting on my last nerve. Two days ago the older one went for the throat of the younger one! It took me 15 minutes to tear them apart!!! I'm shocked that I did not get bitten. I separated them for the remainder of the day. The next day, they were right back to the growling. I do not want to have to rehome one of beloved dogs, so please any assistance will be greatly appreciated. Oh, I had them both in for check-ups, separately, and the Veterinarian found no medical issues, but he was unable to offer me any lasting solutions. I can not keep them separated permanently because they are both in home pets.